AP MEDCO MCET AC 2019 Notification MCET AC 2019 Online Web Based Entrance Test: Andhra Pradesh Private Medical & Dental Colleges Managements Association has given MCET-AC-2019 Notification in the month of May 2019. An online (web based) Common Entrance Test, designated as MCET-AC-2019 will be held by the Andhra Pradesh Private Medical & Dental Colleges Managements Association, Vijayawada for entry into B category (MCET-AC ranking based Management Quota) seats of MBBS & BDS courses for the academic year 2019. 1. 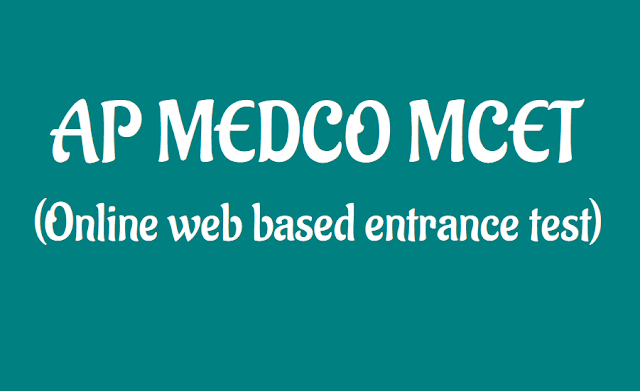 Online application form: The online application form is available at www.apmedco.com. The candidates shall fill the on line application form. The Registration fee for the MCET-AC is Rs.1,800/- (Rupees Eighteen Hundred only). The fee can be paid by credit card or debit card or by net banking. 3. The candidates are advised to take a printout of the filled in application form after completion of the application form and to note down the application number. The Computer Based (Online) MCET-AC will be conducted on 24-05-2019 from 2.30 P.M to 5.30 P.M at the centres notified. (Reporting time at Test Center allotted is at 1.30 P.M sharp and candidates will not be allowed into the test centre after 1.45 PM The Examination process will be commenced by 2.00 PM sharp). The duration of Examination is 3 hrs (180 minutes). a. Question paper is of MCQ pattern. Candidate has to choose single most appropriate answer from four options provided. c. Each correct response shall be awarded one mark. d. There is no negative mark for incorrect response. e. No mark will be given for the question not answered. f. Minimum marks required to qualify in the entrance test shall be 50%. As per Medical Council of India / Dental Council of India regulations, the candidates shall secure minimum of 50% marks in the Computer Based (Online) Entrance Test to become eligible for admission into MBBS/BDS courses.